Most firewalls have a 'DMZ' setting, but are they actually a full DMZ firewall? DMZ is a term often used in network security, but it can mean two different things to manufacturers and practitioners. Technically, there is no such thing as a DMZ in a firewall architecture, only a screened-subnet firewall, screened-host firewall or an exposed host, but the term is the industry standard when talking about allowing access to information servers (e.g. web, mail, etc.) from the Internet. So what is a DMZ? DMZ stands for Demilitarized Zone and is, obviously, a military term for the no-go area between two armies where no military activity is allowed. However, in network security terms it is a secure subnet that separates the Internet from the internal machines on your network. This becomes a logical place to implement any Information Servers, as these can be partially opened to the Internet, whilst not allowing direct access to the internal network. So are all DMZ firewalls the same? Well, no they aren't. They range from small SoHo (Small Office/Home Office) routers up to full enterprise-level firewalls. Of course the majority of SoHo routers are not DMZ firewalls at all; their DMZ features are actually exposed hosts, which have less protection than a normal machine and little or no separation from the internal network. This is bad, as any successful attack on the exposed host now has free range over the internal network. Moving towards proper enterprise firewalls, we still have two different types of firewall often referred to as a DMZ firewall; they are either logical or physical DMZ firewalls. Obviously, the physical DMZ firewall offers the best level of security, but what's the difference? The difference is that they are a screened-host and a screened-subnet firewall respectively. Although your firewall arrives as a single rack-mounted unit, internally it is made up of a set of components - most notably packet filtering routers and a bastion host. 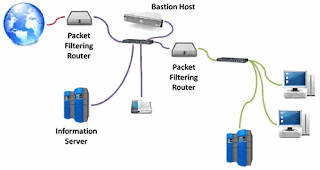 The packet filtering routers simply permit or deny access based on IP address, TCP port number or protocol type. More sophisticated functionality is implemented by using proxies on the secure bastion host. The diagram below shows the logical setup of a full DMZ firewall, with a separate screened-subnet (purple) between the insecure Internet (red) and the secure Intranet (green). The point here is that no communication is allowed directly from the Internet to the Intranet. All traffic can be forced through the Bastion Host to perform URL, content, virus and SPAM filtering, among others. In the screened-host solution, there is no internal packet filtering router or separate screened-subnet. The information servers are logically separated from the information servers, but not physically. They may be on different VLANs (Virtual Local Area Networks) and physical firewall ports, but they are only separated by the logic of these mechanisms. One way to tell if your firewall is a screened-host is to see if you can set an Access Control List (ACL) between your information servers and your internal machines and see if the virus checking will work between them as well. If you can't set up an internal ACL or perform real-time virus checking on internal traffic, then you probably have a screened-host firewall. The most secure way to implement a firewall is to have the full screened-subnet firewall, depicted above. This solution can have multiple internal connections that are all separate networks connected via the firewall. The advantage of this is that there is physical separation between your information servers and your internal machines. Indeed, it is possible to separate your organisation internally into departments or by access medium, i.e. wired and wireless networks are physically separated and wireless networks are treated as less secure. Another 'best practice' is to have your servers separated from the rest of your network and restrict access to them. If you have an intranet server, for example, why allow more than HTTP (port 80) and HTTPS (port 443) access to it from your network? If we lock the network down in this way we can better halt the spread of malware on our internal network even if we do get infected. This is moving towards bringing the firewall in from the edge of the network to the core, to protect our network as a whole. Remember, firewalls can't protect against traffic that doesn't go through them.